8:30 am Meet at Desert Discovery Center parking lot if you want to carpool or caravan, 831 Barstow Road, Barstow. Bring water to drink, snacks and sun protection, like a hat! 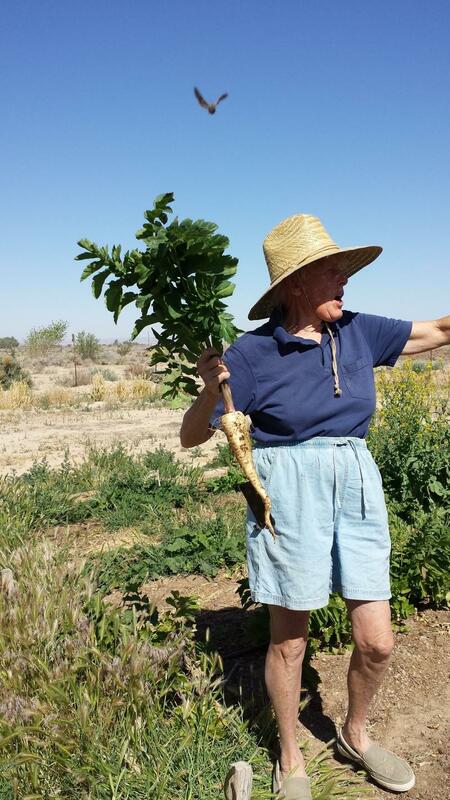 9:15am Aquarius Ranch, Hinkley, Penny Harper. Take I-15 south, turn onto 58 Expressway towards Bakersfield. Drive 8 miles. Take the Hinkley Rd. Exit. Turn right/north. Go 6.4 miles north on Hinkley Rd. Turn right onto Plymouth Rd. where pavement ends. Go about ¼ mile. Turn left into 21966. There is a solar heated greenhouse, shade room with worm boxes, goji berries and other sun sensitive plants. Also are pastured chickens, guineas plus peacocks; vegetable garden, fruit and nut trees, grape arbor, solar powered well, windbreak trees, compost piles, cats and dogs, with many examples of permaculture. 760-514-3440. 10:30am Hills Ranch, San Bdo Co., Peg Diaz. You will be asked to sign a release of liability form. Go south on Hinkley Rd., cross over 58 expressway bridge. Turn left on Community Blvd. Go 5 miles. Turn right/south at 25749 down long driveway. Curve to left at vintage car. This is a former dairy turned into a forest, over 100 years old with over 45 varieties of trees. They include hackberries, cork oaks, grape vines, apricots, mulberry, almonds, persimmon, locust, ash, Chinese pistash, jujubes, Damson plums, vegetable gardens, chickens, 2 greenhouses, solar powered home, antique farm equipment and silo. 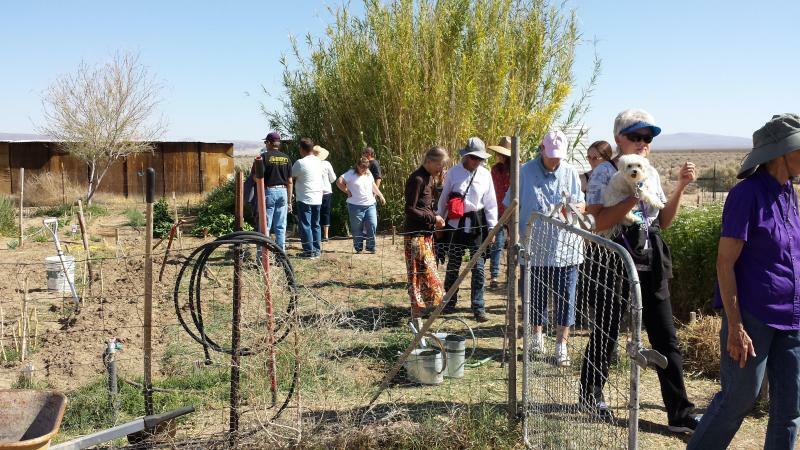 12:00pm Worm Farm, Yermo, Larry Staggs. Leaving Hills Ranch, turn left/west on Community Blvd. Turn right on Lenwood Rd., right/east on 58 Expressway, merge onto I-15 north, pass through Barstow, heading to Las Vegas. Exit 194 Calico Rd., turn right/south onto Calico Rd. Left/east on Yermo Rd. Red composting and fishing worms, worm castings and plants all for sale. 760-217-1963. 1:30pm The Ranch, Barstow, Dr. Reddy. 35190 Marks Rd. Return to I-15, go 6.9 miles south toward Barstow, exit Old Highway 58. Turn left on Soap Mine Road, then right on Marks Road. Look for low black wrought iron fence on right. You will see examples of French Intensive gardening. A pomegranate forest is being planted; there are worm beds and hundreds of heirloom tomato plants started from seed. There is a clear Fiberglas panel greenhouse being constructed and an automatic irrigation system in progress. Also there are horses and a lovely pond. Note: There is a lot of walking on uneven ground on all these properties, hazards like holes and rusty wire, and the weather is usually quite hot. There will not be many places to sit down in the shade. 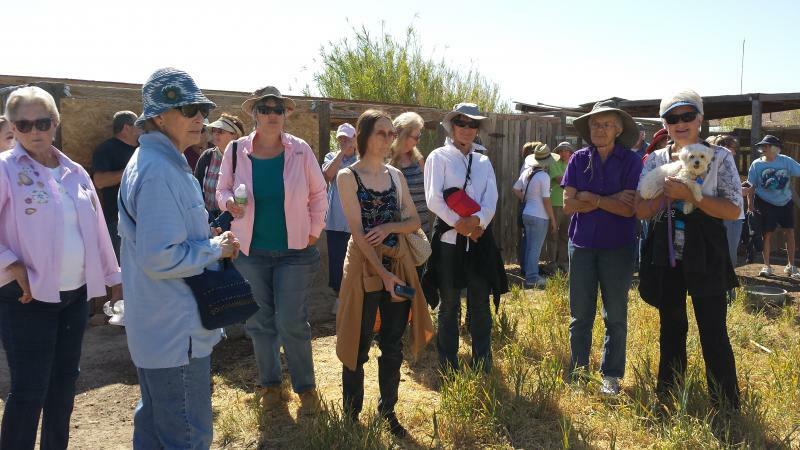 By participating in this tour, you agree to hold the property owners and the High Desert Gardening Group blameless for any mishap you may have in connection with the tour. 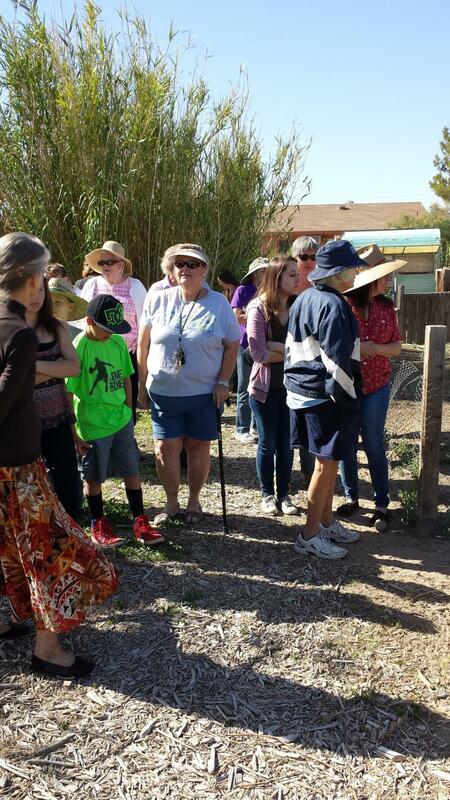 High Desert Gardeners﻿ Meet at Desert Discovery Center 831 Barstow Road, Barstow 1st Saturday of each month at 11:30 am. Next meeting Sat. May 4, 2019. The topic is "Transforming Desert Soil," make barren desert fertile so you can grow plants successfully. 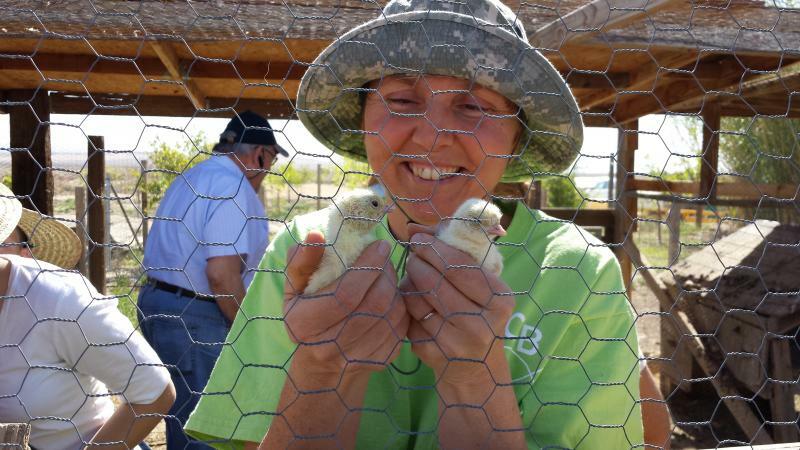 Above-Joan Daley, our former poultry wrangler, shows off the baby turkeys hatched right during the tour.﻿ Pastor Dave Henry, from Calvary chapel, Barstow, in the background. Copyright 2015 Aquarius Ranch. All rights reserved.